Today we left Alnwick, via the bike shop because John had a broken spoke on his back wheel and was very reluctant to trust it over any long distance. We called in at Cycle-Life where a very helpful young man sorted out the appropriate spare part that he needed, and then we headed for the Scottish Boarder and arrived at our next destination - Beecraigs Country Park just in time for lunch. We checked in and we were tempted by a number of goodies on sale in their shop - we brought lovely venison steak (for John's birthday tea), venison sausages and delicious fudge, which we excused by saying we would save it for extra energy when we went cycling the next day! The camp site was under development in areas but was almost empty while we were there, and the facilities were excellent, but having said that, because the school holidays have started in Scotland, it was quite expensive. Accompanying us on our arrival was a mass of grey cloud and rain, but we were quite optimistic and decided it was just a shower so we would be able to go out and explore the park later. We had some lunch and John fixed his bike and then we decided that the weather was improving so we set of for our walk. How wrong we were!! We had been walking for about 45 minuets and were at about the furthest boundary of the park from our van when the heavens opened..We got soaked to say the least, the paths became muddy and I wouldn't say I sulked but I did need to nip back to pick my dummy up!! Anyway, I soon got over it, especially when the sun came out again. The park is lovely and has numerous trails for mountain biking and walking and there are a lot of animals to see as well. Our itinerary today included visiting the Kelpies and the Falkirk Wheel. We set off on our bikes in bright sunshine and headed towards Linlithgow where we picked up the Union Canal which we followed for a few miles. We left the canal at Polmont and continued our journey towards Helix park over minor roads and cycle tracks, and when we entered the park we got our first view of the magnificent and breathtaking Kelpies. We had our lunch in the shadow of the Kelpies, but alas we couldn't go inside as the tour wasn't available today, but having said that we felt the magnificent view from the outside was really all we needed to see. The location of these structures is in Helix Park standing next to the Forth and Clyde Canal. Wikipedia informs me that they stand 30 meters high, were designed by Andy Scott and were completed in October 2013, but not opened to the public until the following year. The Kelpies are a monument to the horse's historic role in agriculture and industry, but their obvious association with the canals as tow horses was what they most seemed to represent. 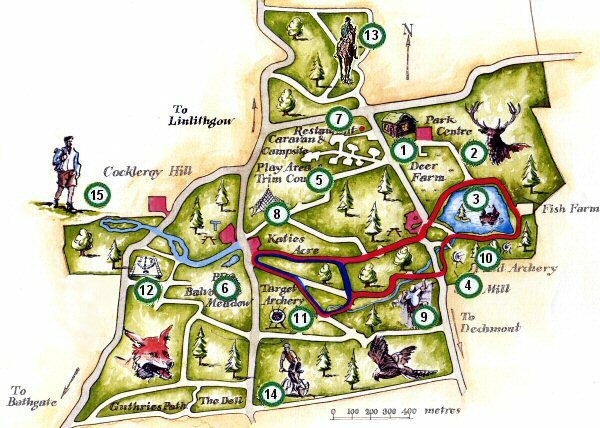 Helix park also has numerous other visitor attractions including a brilliant adventure play area, miles of cycle track, wetland walks and the usual eateries and gift shops. Following lunch, we set off for the Falkirk Wheel along the Forth and Clyde Canal ,which is a well paved and easy to follow route that leads right up to Wheel basin. Again, it is very commercial and has numerous attractions for families and enthusiasts alike. We watched The Archimedes tour boat being loaded onto the Wheel and transported up to the higher waterway - a unique feat of engineering which we later discovered originated in our home town of Ripley at the former Butterley Engineering Steel Works. A team there manufactured and assembled the 1200 tonnes of steel like a giant construction kit to ensure a perfect final fit, then in summer of 2001 it was dismantled and transported on 35 lorries to Falkirk, before being bolted back together again. It was finally officially opened in 2002 and apparently, it only takes the same amount of energy to turn as it does to boil 8 kettles!! After watching for a while we wended our way up the hill to the higher waterway and stopped to for coffee and the earlier mentioned fudge. We then entered the first of 2 tunnels. This was Rough Castle Tunnel which is approximately 147 metres long, and the second one was Falkirk Tunnel, an eerie place that was much longer, darker and scarier at 631 metres. As we walked our bikes through, the structure of the roof changed from rough hewn rock that was dripping, and in some places pouring with water, to a more uniform stone dome. There were even tiny stalactites forming in some places. It was also here that I had a near disaster - as I stopped to take the picture below my bike slipped and very nearly landed in the canal - it would have been a very long walk back! We rewarded ourselves with a lovely venison steak dinner which was celebration of our excellent 32 mile ride and also a day early for John's birthday. We celebrated a bit early because our intention was to wild camp the next night but that didn't quite work out as planned! !